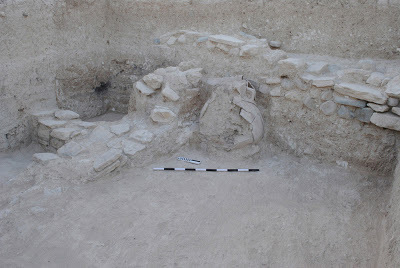 The Department of Antiquities, Ministry of Communications and Works, announces the completion of the 2013 archaeological investigations at the Bronze Age (ca. 2000-1500 B.C.) site of Politiko-Troullia, conducted under the direction of Dr Steven Falconer and Dr Patricia Fall of La Trobe University. Politiko-Troullia is situated about 25 km southwest of Nicosia near Ayios Irakleidios Monastery in the copper-bearing foothills of the Troodos Mountains. The 2013 fieldwork revealed extensive evidence of the Bronze Age community that was the predecessor of ancient Tamassos, the seat of a centrally important kingdom during the subsequent Iron Age. These excavations brought to light a pair of large communal structures, plus a series of surrounding households. A village courtyard lay adjacent to a lengthy alleyway, which was paved with layer upon layer of broken potsherds, animal bones and other debris discarded by Politiko-Troullia’s inhabitants. The village courtyard provided the most striking artifact excavated in 2013: a nearly-complete askos bird figurine. This large figurine depicts a quail-like bird, missing only its head or spout. This find is particularly intriguing, since askos figurines are most commonly found in tomb deposits. This askos is one component of several lines of evidence suggesting communal, perhaps commemorative behaviours in open public settings at the heart of this Bronze Age settlement. Other village artifacts include a rare stone plank-shaped figure, large stones for grinding crops, as well as beautifully polished red pottery bowls, some with ornate spouts. The ruins of a collapsed house encased several smashed jars and painted cups on a floor ringed with mudbrick bins, suggestive of agrarian storage and processing. The archaeological deposits at Politiko-Troullia reach depths of up to four metres below the modern surface, making this one of the most deeply stratified sites on the island of Cyprus. Archaeological survey of the local landscape shows that the hills around Politiko-Troullia have been terraced and managed intensively for centuries, perhaps beginning as early as the Bronze Age. The ancient villagers of Politiko-Troullia cultivated grapes and olives, and herded sheep, goats, cattle and pigs. They also hunted considerable numbers of deer and wild goat. The results from Politiko-Troullia open an archaeological window on the farming and mining communities that provided the foundation for urbanized civilization on Cyprus. The project directors are particularly grateful for the kind support, encouragement and friendship offered by the people of Pera (Orinis) and Politiko, most especially by mayors Costas Miliotis and Andreas Voskaris, the teachers of Pera and Kambia schools, and friends and colleagues in the Pera community.